Research reveals that when we dehumanize particular groups of people, we tend to support discriminatory policies against them and perpetuate injustice both within and outside our borders. This fall, Critical Connections and Karuna Center for Peacebuilding will organize the ‘Rehumanizing and Restoring Relationships’ series, to better understand what leads us to value certain communities over others, explore the social and political implications of treating some people as less "human," and discuss ways in which we can address historical injustices to repair and build community relations. Since 2004 HATD, a Northampton-based program founded by local physician Dr. Norbert Goldfield, has worked to improve the health of marginalized people living in Israel and Palestine by supporting community-based health initiatives. Join us to hear about these programs from coordinators Nehad Awad and Patrick Levy—they will talk about the challenges and opportunities inherent in their work while working in a charged political environment. 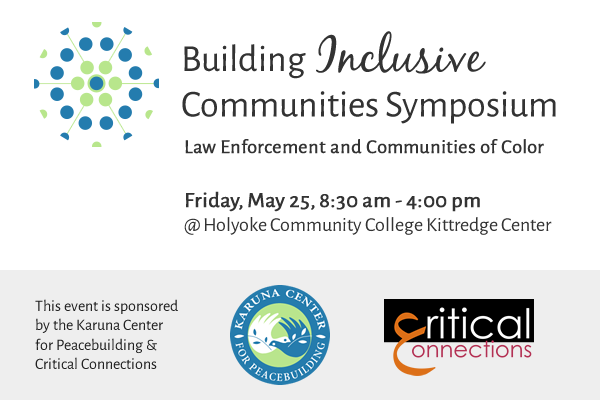 Critical Connections convenes timely panel discussions, dialogues, and workshops across the Connecticut River Valley with our partner Karuna Center for Peacebuilding. Last year, our Transforming this Moment series responded to the increasing polarization that affected our country in the wake of a contentious presidential election--we examined the underlying causes of the various divides that fracture our communities and ended the year with launching our 'Building Inclusive Communities' series. 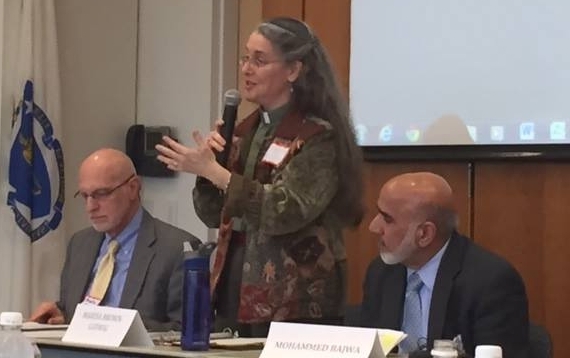 The first event in the series explored the critical role of faith leaders in creating inclusion within their congregations and in the broader community. We will continue to examine the role of various public sector officials in creating diverse and pluralistic communities and will convene two more symposia this year. Our aim, as always, will be to help create communities that are informed and empowered against the forces that seek to divide us. We hope you will join us in 2018 with greater resolve and resilience. We will begin the new year with a conversation with constitutional law expert, Professor Sudha Setty, on the perils of government secrecy in matters of national security and counterterrorism. At a time of national reckoning and accountability around sexual harassment, how are women of color experiencing this moment? 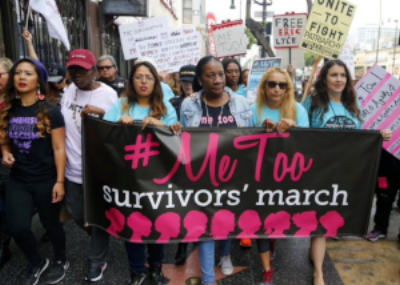 What are the opportunities and challenges for minority women to speak out against sexual harassment both historically and as part of the #MeToo movement? What are the underlying causes of misogyny in American culture and what are the legal, political, and social shifts required to address the prevalence of sexual harassment in society? Join us in February to hear Professor Shaheen Pasha (Department of Journalism, UMass Amherst) and Gina Beavers (Arts and Culture Editor, The Valley Advocate) speak on this critical issue. Pasha is the co-editor of Mirror on the Veil: A Collection of Personal Essays on Hijab and Veiling, published by Critical, Cultural and Communications Press (2017) and is a contributor to The Dallas Morning News, New England Public Radio, USA Today, Daily Beast and Quartz, among other news outlets. Her areas of focus include international journalism, Islam and religion, business reporting, and mass incarceration issues. She has a master's degree in journalism from Columbia Graduate School of Journalism and a bachelor's degree in speech communication from Pace University. Raised in Northern Ohio, Gina Beavers earned her B.A. and M.A. in American History at the Universities of Pittsburgh and Massachusetts Amherst respectively. She is the Arts and Culture Editor at the Valley Advocate newspaper and serves on the steering committee of the Springfield Central Cultural District. Ms. Beavers is a writer, painter and a graphic artist; she has been a part of the Western Mass artscape for twenty years and her work has been widely exhibited and can be found in homes throughout Greater Springfield, the Northeast, California and even South Africa. MS. Beavers has been commissioned to do countless paintings and graphic designs. She has also created commissioned public art projects in Springfield. Ms. Beavers illustrated the children's book Coota and the Magic Quilt and the covers of The Practice of Power: Finding Success in a Diverse World by Tom and Janine Fondon and I Am: Renewal from Within the Garden by Lucie K. Lewis. A year into the Trump presidency, we hope to explore the broad contours of the administration's approach to the Middle East and understand what the next few years will look in terms of U.S. relations with Saudi Arabia and Iran, approach to the Israeli-Palestinian conflict, the U.S. role in Syria, counterterrorism operations, etc. We will also examine how U.S. foreign policy towards the Middle East has been shaped over the decades and its impact on the way ordinary Americans perceive the region and the broader Muslim world. What must we as citizens know about our shifting diplomatic position in order to keep our government accountable? To better understand the current direction of U.S. foreign policy in the Middle East, join us for a conversation with UMass Professor David Mednicoff and Professor Osamah Khalil, Syracuse University. David Mednicoff is Director, Middle Eastern Studies and Assistant Professor of Public Policy at the University of Massachusetts in Amherst. His research deals with broad connections between legal and political ideas and institutions at the national and transnational levels, particularly as these relate to current issues in the Middle East. His articles and book chapters analyze the rule of law, human rights issues, Western legal aid, US policy, migrant worker law and policy, political liberalization and constitutionalism in the Middle East, especially Morocco, Qatar, Tunisia and the UAE. He is currently completing two book manuscripts on the politics of the rule of law in five Arab societies. Osamah Khalil is an Associate Professor of History at Syracuse University’s Maxwell School of Citizenship and Public Affairs. He is currently serving as the Interim Director of Syracuse’s Middle Eastern Studies Program. Khalil is the author of America’s Dream Palace: Middle East Expertise and the Rise of the National Security State (Harvard University Press, 2016), which was named by Foreign Affairs as a Best Book of 2017. He has been a frequent media commentator and contributor, including for the Huffington Post, Los Angeles Times, The Hill, Al Akhbar, The National, and Al Jazeera. Transforming this Moment: Bridging our Divides. The Transforming this Moment Series is convened in partnership with the Karuna Center for Peacebuilding and is sponsored by Mass Humanities, whose grants inspire considered thought, conversation, and action. How can faith leaders address racism, homophobia and religious intolerance within their communities? What are the challenges and opportunities they grapple with to promote inclusion and diversity, and what are effective strategies to develop empathy and understanding? Americans are more divided than at any time since the Civil War and conventional approaches to reconciliation seem inadequate. How should ordinary citizens approach seemingly intractable political divides in our country? Is it possible to promote social justice without contributing to the current polarization? Professor Peter Coleman, who has devoted his career to analyzing protracted conflict, joined us on October 19 to share the lessons that his interdisciplinary research can shed on our “political polar vortex” and also describe opportunities that can emerge from the current political crisis. The term “radicalization” has dominated the global conversation recently, brought to the forefront by the harrowing events in Charlottesville and Barcelona. How is militancy cultivated, drawing one to operate within an extremist group? What does the path back from violence look like? Few offer a more informed and personal perspective than Mr. Mubin Shaikh. A former Muslim extremist, he became an undercover operative for the Canadian Security Intelligence Service and currently advises U.S. national security agencies on deradicalization and counter terrorism. On September 19, Mr. Shaikh spoke about his work in the field and personal path away from extremism to rediscover his faith. Christian Picciolini, a former white supremacist who left the skinhead movement in the 1990s, spoke to a large crowd about his violent past at the Flywheel Collective in Easthampton on April 5, 2017. Picciolini joined the white supremacist movement in 1987 after being recruited to the movement at the age of 14. Critics of Islam often make the case that Muslims are bound by Qur'anic injunction to offensively and violently wage jihad against non-Muslims. Concurrently, groups like the Islamic State of Iraq and Syria (ISIS) are openly calling upon Muslims to engage in jihad to launch a new-age Islamic caliphate in the Middle East. What is the concept of jihad in Islam and how should we understand the Islamic view of armed struggle? 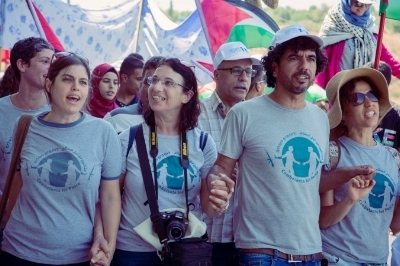 Jewish, Muslim, and Christian activism in the U.S. plays a critical role in shaping public opinion and U.S. policy with respect to the Palestinian-Israeli conflict. Israel's military campaign in Gaza this past summer highlighted the increasingly important role of diaspora communities in influencing the narrative and hence the trajectory of the conflict.